From what it eats to how it looks, North America’s most common deer changes with the seasons. The days are growing shorter, and a chill nips the air. But for this white-tailed deer, fall is no time to curl up and get cozy. It’s the busiest season of the year! For now, food is plentiful. There are protein-packed acorns, golden grasses, and maybe even ripe apples to nibble on. A fattened-up deer has a good chance of surviving the long winter months ahead, so a whitetail spends its days eating as much as it can. Fall isn’t just the season for chowing down. It’s also mating season. Males, or bucks, are on the lookout for females, or does, to mate with. So the bucks start hanging out near does while they graze. This gives the does a chance to get a good look at each buck. Does he look strong? Healthy? Does he have an impressive set of antlers? If so, there’s a good chance a doe will decide he’ll make a fine father. Acorns may make up more than half of this hungry buck’s fall diet. Antler to antler, two bucks squabble over which one gets a chance to mate. In winter, whitetails gather in places that shelter them from snow and harsh winds. Brrr . . . it’s winter now. The berries, nuts, and grasses that kept a whitetail’s belly full during fall are either gone or hidden under a blanket of snow. Unlike some animals, a white-tailed deer can’t sleep away the winter in hibernation. So what’s a hungry deer to do? Change its diet with the season, of course! 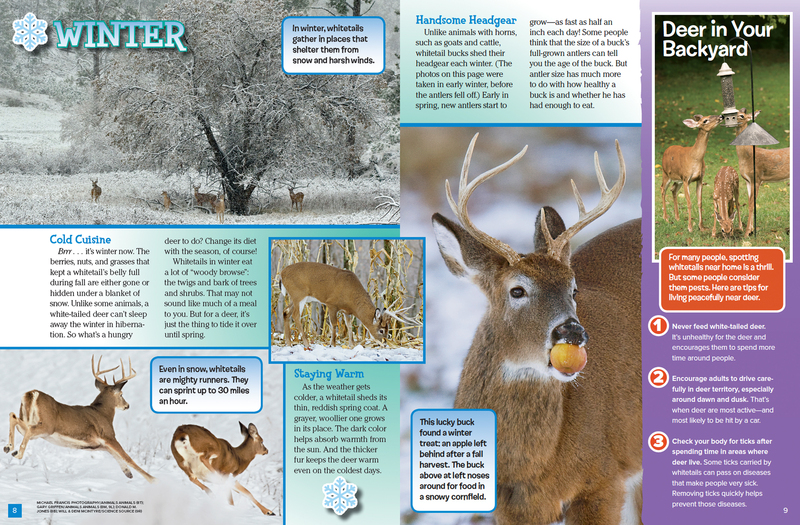 Whitetails in winter eat a lot of “woody browse”: the twigs and bark of trees and shrubs. That may not sound like much of a meal to you. But for a deer, it’s just the thing to tide it over until spring. Even in snow, whitetails are mighty runners. They can sprint up to 30 miles an hour. As the weather gets colder, a whitetail sheds its thin, reddish spring coat. A grayer, woollier one grows in its place. The dark color helps absorb warmth from the sun. And the thicker fur keeps the deer warm even on the coldest days. Unlike animals with horns, such as goats and cattle, whitetail bucks shed their headgear each winter. (The photos on this page were taken in early winter, before the antlers fell off.) Early in spring, new antlers start to grow—as fast as half an inch each day! Some people think that the size of a buck’s full-grown antlers can tell you the age of the buck. But antler size has much more to do with how healthy a buck is and whether he has had enough to eat. This lucky buck found a winter treat: an apple left behind after a fall harvest. The buck above at left noses around for food in a snowy cornfield. For many people, spotting whitetails near home is a thrill. But some people consider them pests. Here are tips for living peacefully near deer. Never feed white-tailed deer. It’s unhealthy for the deer and encourages them to spend more time around people. Encourage adults to drive carefully in deer territory, especially around dawn and dusk. That’s when deer are most active—and most likely to be hit by a car. Check your body for ticks after spending time in areas where deer live. Some ticks carried by whitetails can pass on diseases that make people very sick. Removing ticks quickly helps prevent those diseases. A wobbly newborn fawn gets an encouraging lick from Mom. The snow has melted, and the world is green again. It’s time for does to give birth to their babies, called fawns. Whitetail moms have one or two—sometimes even three—fawns at a time. Each fawn weighs about the same as a newborn human baby. But, unlike a baby, a fawn can walk just a few minutes after it’s born! While a whitetail mom searches for food nearby, her tiny fawn lies safely nestled in a protected spot. (If there are twins or triplets, Mom will keep them in separate places.) The white-spotted fawn stays mostly still, hidden in the dappled shade. After a few weeks, it will be strong enough to venture out for summer meals with Mom. 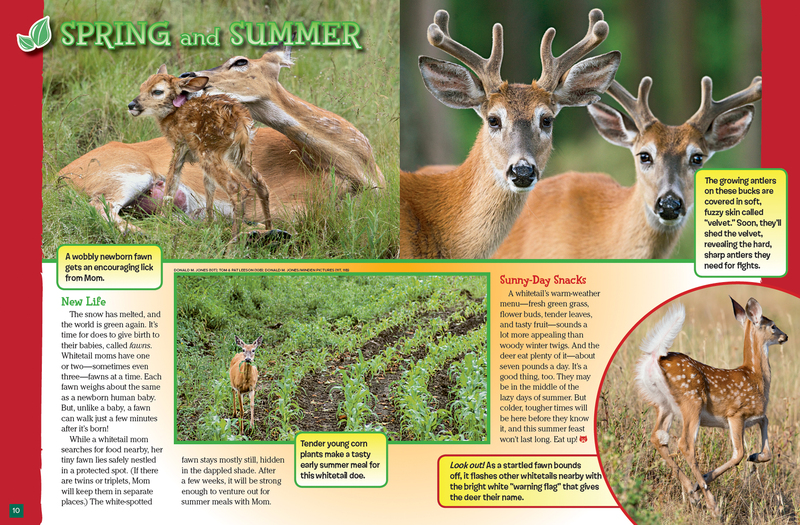 Tender young corn plants make a tasty early summer meal for this whitetail doe. A whitetail’s warm-weather menu—fresh green grass, flower buds, tender leaves, and tasty fruit—sounds a lot more appealing than woody winter twigs. And the deer eat plenty of it—about seven pounds a day. It’s a good thing, too. They may be in the middle of the lazy days of summer. But colder, tougher times will be here before they know it, and this summer feast won’t last long. Eat up! The growing antlers on these bucks are covered in soft, fuzzy skin called “velvet.” Soon, they’ll shed the velvet, revealing the hard, sharp antlers they need for fights. Look out! As a startled fawn bounds off, it flashes other whitetails nearby with the bright white “warning flag” that gives the deer their name. 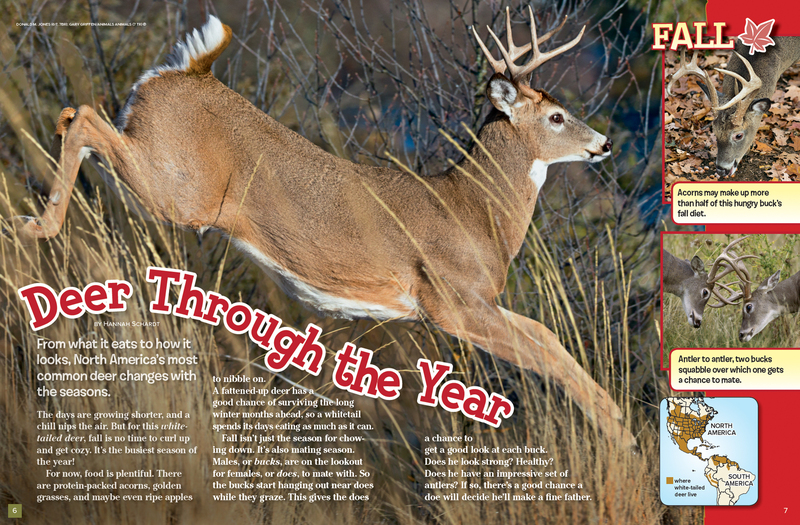 “Deer Through the Year” appears in the November 2016 issue of Ranger Rick magazine.